TB Electrics' main office is based in Wallington, Surrey. We are a family run business with a highly professional approach. Established for over 30 years, we are able to provide the highest standard of electrical knowledge, alongside top quality workmanship and of course, competitive prices. TB Electrics offer a FREE, no obligation quote on all of our electrical services! 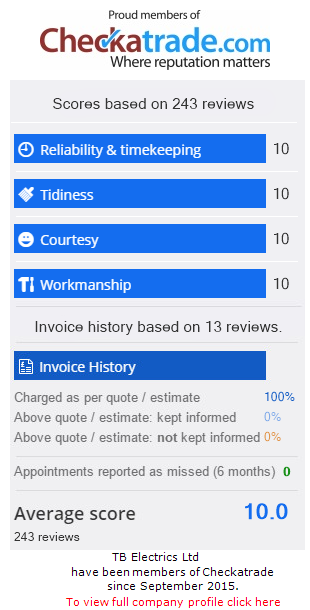 Our reputation in and around the local area is second to none, so contact us today. We are always on hand when you need an Emergency Electrician in Wallington, Purley, Carshalton, Croydon, Sutton, Mitcham and the surrounding areas. "Had a power trip in the flat. Desperately tried all electricians around. Fortunate to call Joe, helped me to resolve the issue through the phone as he is on other work that time. Visited the flat next day morning and did a complete check and gave out his recommendations. Excellent service and would always recommend." "I am a professional landlady and I found this company prompt, efficient, knowledgeable, polite. Professional - a rare find and Joe was very personable. Would recommend to friends and professional landlords alike."